The Visiting Nurse Association of the Treasure Coast (VNA) is pleased to announce Kara Henson, Physical Therapist, and Kim Metz, Occupational Therapist, were recently recognized as VNA’s Associates of the Year. 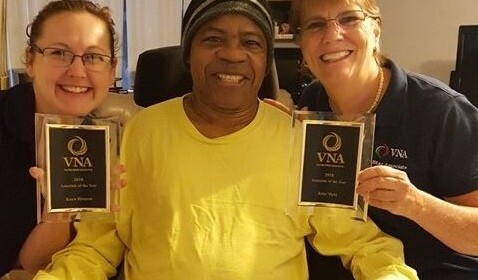 Associates of the Year are nominated by their colleagues for consistently demonstrating VNA’s WHY statement: Collaborating as a team to provide excellent care to patients and families – with integrity, compassion, knowledge and love – so that patients and families experience optimal quality of life at all times! In addition, these employees have shown a commitment to VNA’s core values of integrity, collaboration, accountability, respect and excellence. As therapists for the VNA, Kara and Kim help patients recovering from surgery, illnesses and accidents achieve their physical and occupational goals. Kara and Kim were recognized because they go above and beyond in their care for patients, including one in particular whom they have worked with since 2016. The patient, Eugene, was in a car accident that left him a bedbound quadriplegic. Kara and Kim have worked alongside Eugene from the beginning of his admission and celebrated with him as he walked 100 feet to his church pew last Father’s Day. He is now able to walk with a walker. Kara and Kim collaborated with several departments to ensure Eugene received the best care.